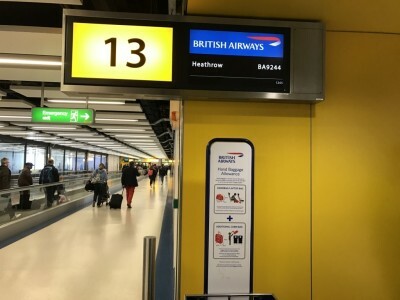 My flight from Gatwick to Heathrow – or, what’s happening at BA? We like to think that Head for Points is an aspirational travel site and we don’t get any fun from writing critical articles. But with Buy on Board in Economy, 2-4-1 downgrades with zero compensation, no checking through baggage on separate tickets, Club Europe hot meals removed on some routes etc many of our recent news stories about British Airways have been far from positive. We tend to have been the bearer of the bad news in most cases – even The Economist described us as “Head for Points, the travel blog that first leaked the story” on the BA service cuts. To “tell the true story of what’s going on at BA”, BA organised a press trip with Chairman and CEO Alex Cruz. We started at Gatwick Airport and flew to Heathrow to see the new Club World dining concept and talk about upcoming investments. British Airways has launched a special website to highlights its planned improvements which you can find here. What you’ll find below is part trip report, part strategy report and, if we’re honest, partly a genuine critique on what the airline thinks it is doing. Despite writing about British Airways virtually every day, we are not beholden to them and, whilst they bring it on themselves, Rob and I know that they are not always keen of our coverage. The truth tends to hurt like that. I was told to arrive at Gatwick in the morning and check in at the designated BA 9244 desk. I had problems finding it at first as it was ‘hidden’ within the new Priority Check-In area (which I must say looks good). I hadn’t been to the new Gatwick Business and First Class Lounges before, but Rob wrote a review and shot a video a few weeks ago so I won’t go into detail. I did like how spacious the new Business Class lounge is and how the various seating arrangements work. The toilet signs could be more obvious as the size of the lounge means you can easily walk off the wrong direction but apart from that I was impressed. The 40 or so journalists from the UK, US and Australia (!) gathered on the mezzanine level, which is supposedly the quiet area of the lounge. We all got Club World seats on a new B787-9 Dreamliner with a ‘decorative’ head rest cover with the hastag for the day: #BAinvesting4U. 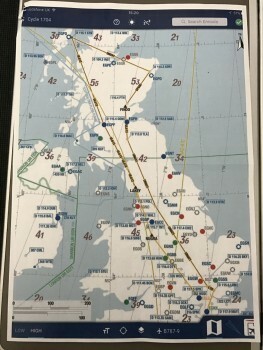 For those who were as confused as me that the flight from Gatwick to Heathrow was going to take 3 hours, here is the flight route. BA has announced a plan to ‘invest £400 million’ to improve the Club World experience. Whilst it was repeated a lot, this number could mean many things. British Airways had to build new Gatwick lounges, for example, due to the switch to the South Terminal, and has to buy some seats for its new aircraft, whether they are a new design or not! Dressing this up as ‘investment’ is not necessarily the whole truth. The good news is that British Airways will (finally) move away from their 20 years old Club World seat arrangement where many passengers have to step over other passengers’ legs in order to reach their seats. The plan is to have all seats with full aisle access as BA “has fallen behind some of their competitors”. However this was all the information he could give at this point. No-one asked him what he thought of the new Qatar Airways business class ‘suite’ with closing doors which is rolling out from June. 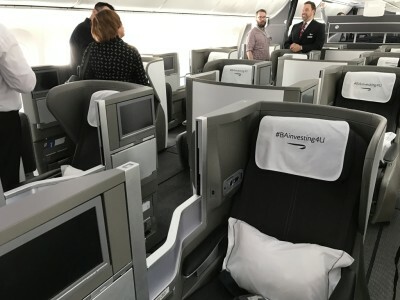 The new British Airways seat will be installed on the A350 and Boeing 787-10 aircraft when they are delivered so that will be 2019 – but no comment on whether it will be retrofitted. My understanding is that it will not be. It isn’t clear if it will be this seat design which leaked out last year or if they have decided to go for something more radical. It would be a genuine sign of progress if they chose to move to something like the current Qatar Airways, American Airlines or Finnair seats. There are no plans to remove First Class. Another investment, although one that has already been announced, is wi-fi on long and short-haul flights. Long-haul passengers will be able to use wi-fi from this month on selected aircraft (North American routes will be prioritised) whilst short-haul passengers need to wait until later this year. The long-haul wifi will be via satellite and the short-haul via ground technology. Currently it looks like a low bandwidth connection (‘Simply Connect’) will start from £4.99 and whilst ‘Connect Plus’ which will let you stream Netflix etc will start from £7.99. Passengers might also be able to pay with Avios but that is not finalised. Monthly subscriptions are also being considered. This is a very positive step forward. Another area where BA was keen to talk up its investment is at the airport, trying to speed up the bag drop and boarding process. 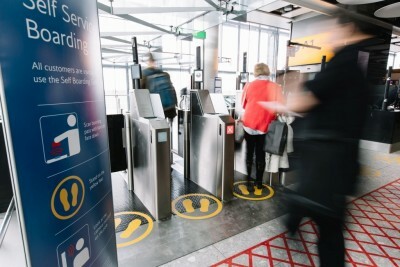 At Heathrow T5 BA currently has one gate with self service boarding for domestic flights (you need to pass a biometric facial check in a similar way to the new electronic passport gates) and will soon have three. 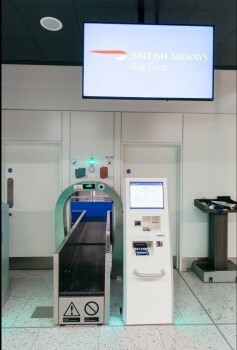 At Gatwick and Heathrow BA has also introduced self service bag drop. In theory you will soon be able to board a plane with luggage without having to look anyone in the face. Is this progress or not? 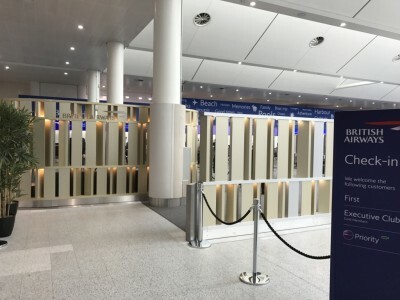 Whilst it wasn’t mentioned on the day, we also understand that BA is about to introduce automatic entry gates for the Heathrow lounges which will operate via a scan of your boarding pass. One of BA’s aims is working on improving passengers’ sleep. In response ‘to customer feedback’ British Airways will be working on changing the service routine in order to maximise sleep hours on overnight flights. The aim is for a flight like New York to Heathrow to maximise the quiet time to 5 hours. We were told that this will be achieved by ‘changing the food service’. Is there a way to make this work without removing the second meal? It seems unlikely. From July there will be new pillows, duvets and mattress toppers. It will initially be available on the New York JFK route with other routes following in 2018. The supplier was not announced as apparently the contract has not yet been finalised. 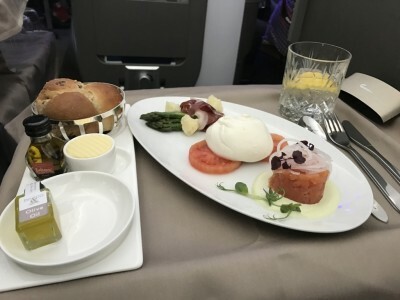 British Airways is going to introduce a new food menu from this Summer and eventually move away from tray service in Club World. A trolley-based service will be introduced with food carts, initially operating from September between Heathrow and New York and then rolled out on other routes in 2018. Lufthansa manages to make this work successfully in First Class, so I believe that this could be a genuine improvement. 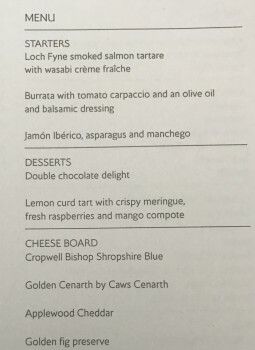 British Airways will have to radically up its game in food presentation, however, if they are to pull this off. Alex Cruz kept emphasising that his focus is on the presentation and quality of their product. 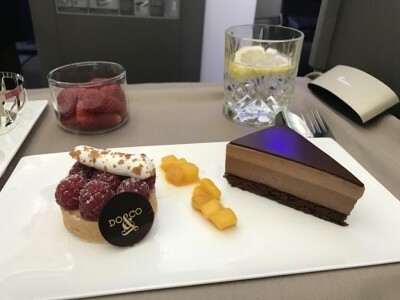 We got to to sample some of the new food during the flight. Don’t get too excited by the picture below. As we didn’t get a main course we got all three starters instead. On a regular flight you would be able to choose one of the three items pictured on my plate. The salmon with the wasabi dressing was gorgeous, I admit. The two slices of tomato and a ball of mozzarella however didn’t convince me. The cabin crew also served us all dessert options. I wasn’t able to eat the chocolate cake as BA loves to put hazelnuts in their chocloate desserts, but the tart was very good. The strawberries weren’t really ripe, but then again it’s not June yet ….. Again, you would only receive one of these three items on a real flight. I put a photograph on the HfP Instagram feed (click) showing the new glassware which is definitely an improvement, although they will still not be using stem glasses for wine and champagne. Last week we revealed the exciting news that bacon rolls would be remaining in the Heathrow lounges until 11am instead of 9.30. Little things like this matter if you are a frequent BA traveller. Lounge catering was not mentioned during the event. 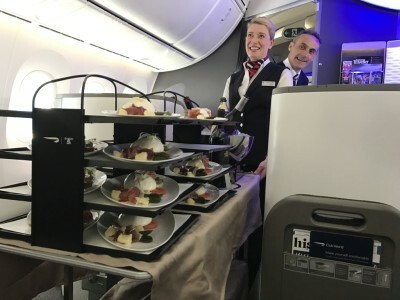 This may have been an oversight as British Airways launched a ‘coming soon’ website yesterday which states that “more choice and better quality food and drink” will be available in lounges from June. This is definitely good news if delivered. The Concorde Room at Heathrow will be overhauled this year with new furniture. The ‘secret door’ from South Security into this lounge will be closed, and First Class passengers will need to use The First Wing, walk through and exit Galleries First and then head into The Concorde Room. 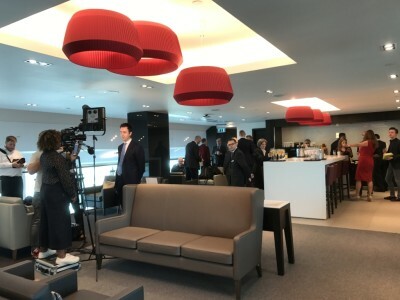 Further lounge refurbishment at Heathrow is under discussion but not for the short term. During the Q&A with Alex Cruz towards the end of the flight we finally heard his opinion on Buy on Board on short haul economy flights. He admitted to a rough start with the crew facing different problems than expected after the training they received. However, according to Cruz “BoB is going great”. BA met their sales targets from day one and BoB is now about to reach “a stable point”. BA has apparently seen a “significant increase in sales” over the last 12 weeks and is looking at other ways to improve the service. He reportedly said at the event that only 2.5% of flights were running out of fresh food. As we noted yesterday, however, Cruz believes that he still has to educate passengers into not expecting to find their first choice of food available. There are no plans to introduce free food for status customers or those on pricier tickets. Cruz feels that there is already a premium (Club Europe) option for people who want inclusive food and drink. There will be additional trolleys on longer flights and apparently M&S wants to experiment with the menu. Cruz believes “the possibilities are endless”. What differences BA’s BoB from other airlines, according to Cruz, is the major brand affiliation, contactless payment (now working) and the option to pay with Avios. I did get the impression that Cruz wanted to convince us that BoB is amazing and that everyone who flies to Rome with BA pays just £29. To be honest for that price I would be willing to pay for my sandwich too. The reality is that BA’s most valuable customers are paying substantially more than £29. Even at £29, in my experience the cheapest prices for BA EuroTraveller still exceed the likes of easyJet and Ryanair and I’m not sure if a branded M&S sandwich will or should convince people to pay much more for their flight ticket. As for the rest of it …. 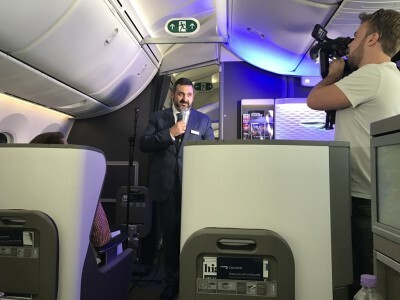 wi-fi on board is a must if BA doesn’t want to be left behind and a new seat in Club World is long overdue – and still not launching for two years. BA also refuses to commit to retrofitting the new seat onto the existing fleet. The new food options look promising although the portions we were served were small. There is a lot more to be done and said on this topic. Let’s see where BA is actually heading and whether they can deliver what they promise to the price conscious as well as to the premium passenger. We landed in Heathrow at around 4:15pm and after a quick glass of champagne in the arrivals lounge we went to the Galleries First lounge via the new First Wing check-in and security area. More on this tomorrow. More information on BA’s investment plans can be found on this special website here. Avios Ireland: 100% bonus on SuperValu transfers into Avios! Does absolutely nothing to address the very big issue of service CONSISTENCY..! I’d have been happy with everything that was, if I could be assured of the same service on every flight. It is so hit and miss I would never pay my good money for anything other than a club sale. An airline that provides consistently good service gets my money. Good to see that Muhammed Saeed al-Sahaf is working again. Do & co raspberry tart.. yum. Bob still a disaster on my recent flight…. I don’t need ‘ educating ‘ about expectation on BOB. EasyJet can stock a wide range and so can Ryanair and Aer Lingus….. stuck on a 4 hour flight back from Larnaca with kit kats for tea is no fun…. 1. Introduce a status match/challenge for BA silver and above members. 3. Make sure their own Economy and Business products are 10x better than BA. I would increase Economy pitch to greater than BA. Ba needs to be hit hard, and the problem is except for Norwegian and EasyJet no big legacy airline has the guts to take these very aggressive steps. Lufthansa, Turkish, Etihad, Qatar etc… I would just do this. The time is perfect to get the big spenders. BTW sitting in a mediocre BA lounge in JFK, The food was aweful, they are so lazy to even top up the food. It is just so disappointing. These damage control measures are too little and too late. This ex-Vueling CEO has totally destroyed this great British brand and our loyalties. If he wants to make it low-cost, then create a low-cost brand or just downgrade BA to a true low-cost. Don’t pretend to be a full-service carrier and charging a premium while taking away everything they are supposed to offer for that price. After all, I’m sure a lot of us fly BA for its brand, Service, Avios, OneWorld Status, and all other things not offered by the low-cost carriers. Year by year, one by one is stripped away to achieve this CEO’s profit margin target. BA has come to a point that it is even worse than AA in its product offerings. If Alex Cruz only cares about the numbers, then why should we care about being loyal to and paying more for this gradually degrading brand. If you’re flying EZY SH and OW (but non-BA) LH, why limit yourself to OW for LH as what do you really get for your BA Gold card? My question was more what do you actually get for your OWE (if you’re flying J anyway LH and use EZY SH)? F check in and F lounges I guess but is that worth paying a premium for over just going for the cheapest (you actually want to fly) carrier regardless of alliance? For long haul flights, elite status makes a difference. For short haul, don’t care. I got your point that if I’m already paying for business class for LH, then why bother about the elite status with an alliance. In my opinion, having an elite status still makes a difference even when you’re already flying in business class, like priority standby when there’s a flight disruption. Whilst this all looks good BA have been dumbing down their service and perks for a few years. The biggest failing is the staff. Recent flights have ranged from OK to down right rude & horrible. I stopped fliyng long haul after Mexico City & MRU in 2016 due to the very poor staff. Other airlines get this money and to be honest, often cheaper and better service. As an aside I notice Rob has a nut allergy. So does my wife and we travel Club in trepidation several times a year with Epi pen at the ready. They serve nuts as a starter and manage to get bits in a lot of their desserts. Staff are nor sure what is in the food. Is it not time to remove nuts (and peanuts) from their menus? In its search for elusive profitability BA had hitched its planning to an apparently unrealistic belief that most of its passengers are proud Brits who’ll remember the glory days, salute the flag and march on board to whatever conditions await them. If this is BA’s admission that they’ve become self-damaging cheap-aholics I hope they understand that they’ll have to go to all the meetings and keep to the path for years before they recover.